As a Texas native and the daughter of a football coach, the start of football season is one of my favorite times of year. As a food lover, the food that goes along with watching football makes it just that much more fun. Whether you’re tailgating or gathered in the living room around the big screen, football and snackage go together like brats and beer, Hook ‘Em and Horns, or, sometimes unfortunately, heartbreaking and loss. As you plan your menus for the next several months of gridiron goodness, consider spicing things up with some flavors of the Mediterranean. Bright citrus, earthy herbs, and fun to eat food like skewers and artichokes may even get your guests to take their eyes off of the game — or their beer — because they’ll be so pleasantly surprised at the unexpected tastes you’ve brought to the game. I’ve been making Grilled Bread with Tuscan Lamb from MyRecipes for a couple of years now because the marinade is chock-full of fresh herbs, it sits overnight, and it makes the most of inexpensive leg of lamb. It’s also surprisingly light, when you eat just one serving of course, and perfect for a quick dinner or a summer party. Recently I repurposed the marinade from this dish to marinade miniature skewers of chicken thighs and lamb sirloin. They were, if I do say so myself, oh so tasty and even a bit fun. Because the meat was on skewers it is easy to cook quickly for a crowd and you can make them in batches as food consumption ebbs and flows. Skewer and marinated the meat overnight; if you’re headed out to a tailgate marinade the skewers in a heavy duty zip top bag and just toss them in the cooler on your way out the door. Cook the skewers over a medium-hote grill for about 3-4 minutes on each side. Be careful not to get the grill too hot or the herbs will burn. 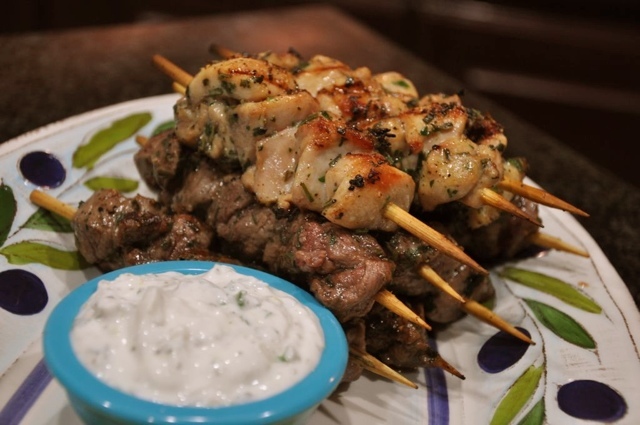 Even though the marinade has a bit of olive oil in it, it’s not enough to keep the skewers from sticking to the grill, so be sure to give them a good once-over with cooking spray. Because the skewers spend so little time on the grill I didn’t soak them before threading the meat on; you certainly can if you’re worried about charred wood – it won’t change the flavor of the dish at all. A container of fat-free Greek yogurt with the juice and zest of half of a lemon and about a tablespoon of chopped fresh flat-leaf parsley makes a lovely spread to go on the naan along with the lamb or chicken. At first glance artichokes seem like a strange partner for a football watching party because they can be so darn high-maintenance from preparation all the way through consumption. However, when you steam, marinade, and grill them, they magically transform in to party-friendly food. Guests can pluck tender leaves from artichoke halves with just two fingers, leaving them another hand free to hold a beverage or make hand-signs (appropriate or otherwise). You do almost all of the prep work, including the cooking of the artichokes, the day before you serve them. All you have to do is heat them on the grill for a few minutes when you’re ready to serve them. Trim the stalks from the artichokes and cut about 1 inch from the top so they will sit flat upside down for steaming. Sprinkle the kosher salt and peppercorns in the bottom of a medium size stock pot. Drop a steamer basket into the pot and fill the pot with just enough water to come to the bottom of the steamer. Set the artichokes upside down in the steamer. Cover with a tight-fitting lid. Bring the water to a boil over high heat then reduce the heat to medium-low. Steam the artichokes for about 30 minutes or until a sharp knife interested into the stem end slides in smoothly. Transfer the artichokes to a bowl and cover them with ice and water to cool them down. When the artichokes are cool enough to handle, cut them in half lengthwise. Use a spoon to remove the choke and the loose inside leaves. Place them in a zip top bag or shallow glass dish. Add the olive oils, vinegar, rosemary, salt, and pepper to a small mixing bowl. Whisk to combine. Pour the marinade over the artichokes and seal the zip top bag or cover the glass dish with plastic wrap. Let artichokes marinade for 2-8 hours or overnight. Heat a gas or charcoal grill to medium high. 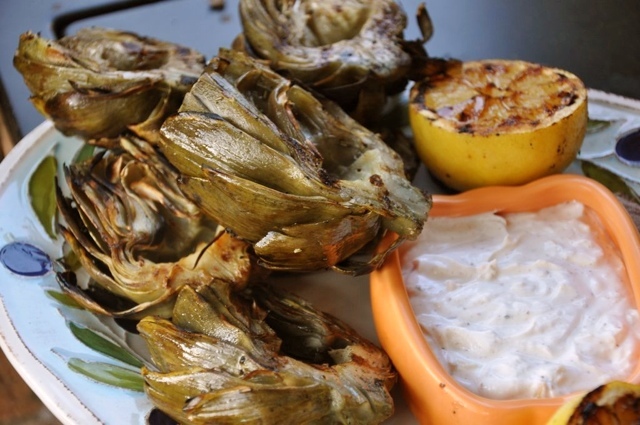 Grill the artichokes for 4-5 minutes on each side or until they are warmed through. You can use whatever size artichokes you’d like or can lay your hands on. I like smaller ones because it’s easy for a person to take a half and go on their way. If you use very large artichokes you may need to steam them for as long as an hour. Do be sure to give the artichokes a good couple of hours to marinade, and overnight is preferable. 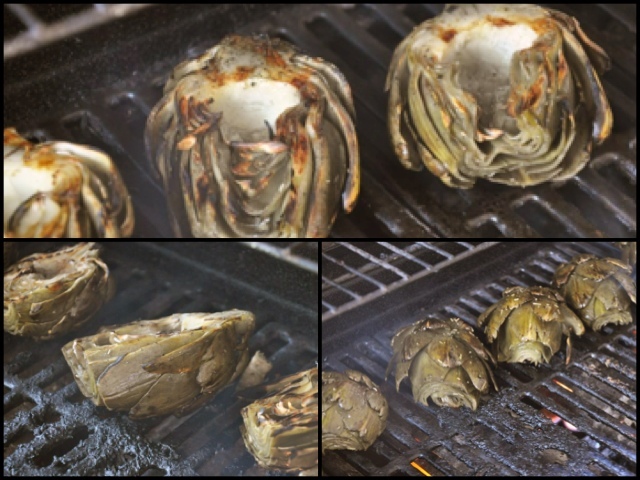 For a great visual tutorial of how to prep and grill artichokes, wander on over to Cooking for Engineers. If you don’t have lemon olive oil, use 7 tablespoons of regular olive oil and one tablespoon of fresh lemon juice for the same flavor. If you don’t have Champagne vinegar available, white wine or red wine vinegar will work just as well. I’d avoid balsamic vinegar though because it will overwhelm the other flavors. Play around with the herbs in this dish. Rosemary and lemon is a classic combination but thyme or oregano would do well too. What are your favorite unexpected football foods? Tell us more in the comments!